Discussion in 'Breaking and Major News about Scientology' started by CommunicatorIC, Jan 25, 2018. 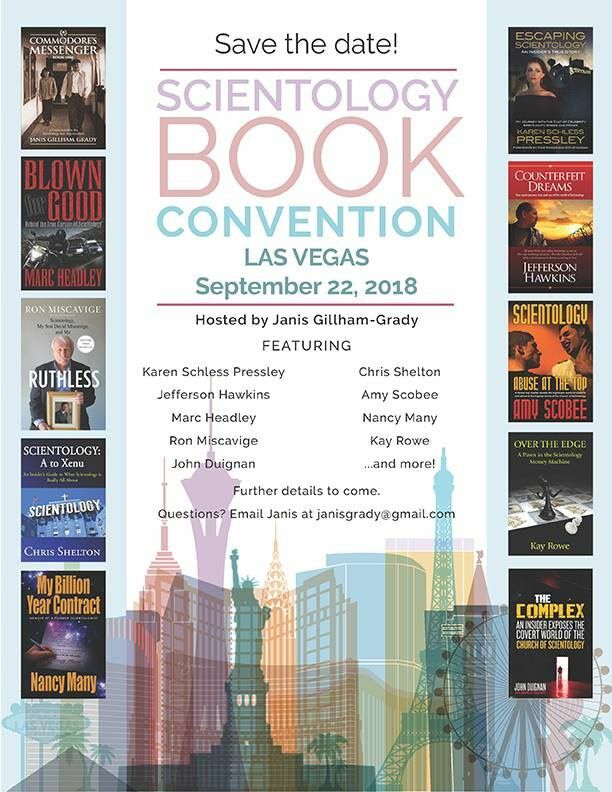 September 22, 2018: Scientology Book Convention, in Las Vegas, Nevada. More information, again courtesy of Intergalactic Walrus on Tony Ortega's blog. 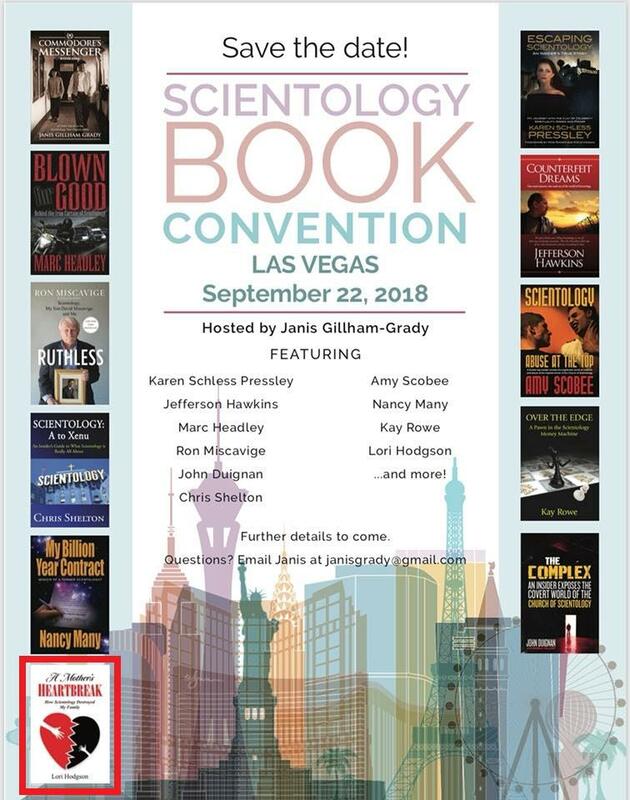 Lori Hodgson and her book “A Mother’s Heartbreak: How Scientology Destroyed My Family" added to Scientology Book Convention. Speaking of book conventions, I recall a story told by publisher Lyle Stuart from a book convention he attended many years ago. Everyone there had a booth with a big table, and displays, featuring books. That year he was soon to publish the first ("emergency") edition of L. Ron Hubbard, Messiah or Madman? The planned cover for the book resembled the Dianetics book cover and featured an erupting volcano with L. Ron Hubbard's head popping out of the top of the volcano. He also had large posters made featuring the book cover and one was on display right behind and above where he was seated. By chance, almost directly across from him was another booth that happened to be the Dianetics book booth. The Messiah or Madman? manuscript had not yet been sent to the printer, but Lyle Stuart had some Madman erupting volcano book covers handy and, recognizing an opportunity for mischief, wrapped one - neatly - around a similarly sized newly released book which was a history of World War II. He placed the history of WW II - wrapped in a Madman cover - on the table and waited. Inevitably, a Scientologist came over, attempting to act nonchalantly, and picked up the book (when he thought no one was looking) and began fervently searching through the book for whatever (pre publication) secrets he could find, in the hopes of alerting the Scientology attorneys in their ongoing frenzied effort to stop the book, and also stop its very annoying book cover. The poor Scientologist spent over an hour furtively looking through the book until he realized it was not the Madman book but a history of WW II. The Hubbard's head shooting out of an erupting volcano book cover was eventually stopped, by court order, but it might have been the best Scientology book cover ever, if it had seen the light of day. As for the best Scientology book cover to have made it to publication, IMO, it would be Russell Miller's Bare-faced Messiah paperback edition. Sounds like the original cover would make a great Protest Sign....? VIDEO: Tory is inviting everyone to a party at the Scientology Book Convention on September 22, 2018 in Las Vegas, NV.